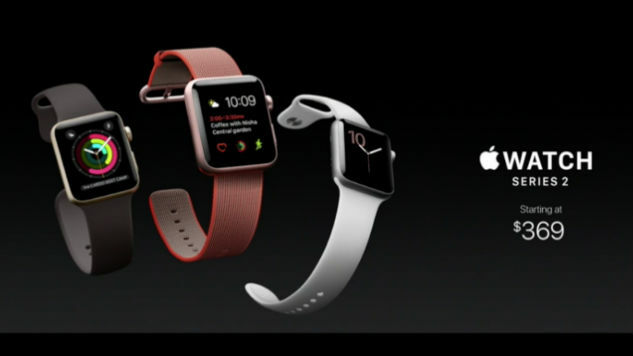 Coming over a year after the original Apple Watch, Apple announced this morning the Apple WatchSeries 2. Although it looks identical to the original Apple Watch(which is now called the Apple Watch Series 1), there were a number of things Apple announced this morning at its keynote presentation that make it deserving of its position as the sequel. The new Apple Watch will be available for pre-order on September 9, though watchOS 3 will available for download on September 13. Apple already showed off watchOS 3, the newest iteration of its Apple Watchsoftware, earlier this year. It introduces a bunch of new ways to use the Apple Watchand by all accounts makes the product significantly better. New watch faces, new ways to open apps, and more messaging features all make watchOS 3 a huge update to the Apple Watch. Fortunately, it’s available for download for the Apple Watch Series 1, as well. The founder of Niantic Labs took the stage and showed a demo of the upcoming Pokemon Go app for the Apple Watch. It looks pretty simple—you can’t catch Pokemon on it or anything, but you can go for a walk or run and work on hatching eggs. It’ll also notify when a Pokemon is nearby so you can pull our your phone and snag it. Although we didn’t get the ability completely untether the Apple Watchfrom the iPhone this time around, we did get built-in GPS, which is a step in the right direction. GPS means the Apple Watch can now do everything those expensive GPS watches do for tracking running routes and making sure you don’t get lost—even without your phone. One interesting example that was used is a new hiking app, which would help hikers stay on routes and get information about trails without need of cell service. The biggest feature Apple was pushing about the Apple Watch Series 2 was that the device is now “swimproof”. What exactly does that mean? Well—it means you can take the device 50 meters underwater and it should still work. It isn’t just for fun though—the device can now be used for swimmers and people who run outside in the rain. What’s more, Apple has also introduced health tracking for swimmers. Not being able to see your screen in the direct sunlight can be frustrating. It’s one of those moments when you think, “Why don’t I just have a normal watch?” Fortunately, Apple has upped the brightness of the Apple Watch quite significantly. It can now go up to 1000 nits, which makes it the brightest display Apple has ever shipped on a product. What this means for battery life, we don’t yet know. Apple announced a new material to add to the stainless steel and aluminum options: ceramic. I’m curious to see what this new material looks and feels like, but Apple says it’s the most durable of all of them. This ceramic version appears to have replaced the Gold Edition in terms of premium price goes: it’s $1,249 for the 38mm version, and $1,299 for the 42mm. We finally get to see why Nike discontinued the Nike Fuelband, a highly successful step-counter. The Apple WatchNike+ is a runner-specific version of the Apple Watch that comes with a rubbery band and unique software that puts running and exercise at the forefront of the device. It helps you quickly get started on a run and even includes reminders that tell you how many days it’s been since you’ve been on a run.